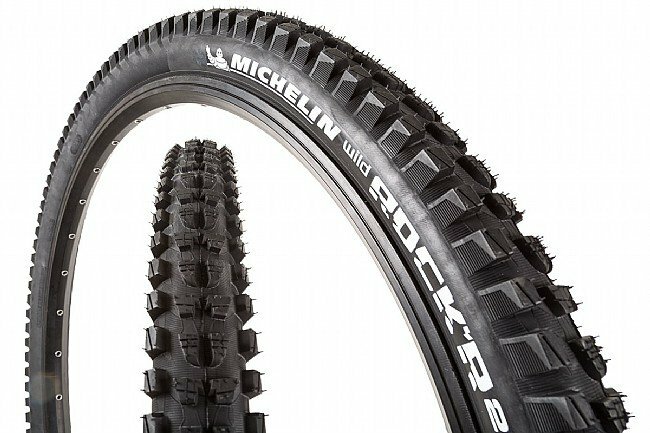 The Michelin Wild Rock'r2 Advanced Gum-X Reinforced 29 Inch MTB Tire is designed for dry and extreme Enduro riding. Its reinforced casing features a bead-to-bead breaker that protects from gashes and impact punctures, and the siped tread means more traction on slick rocks and complex terrain. The center blocks balance rolling efficiency with braking performance by alternating the shapes from transverse to longitudinal, and the large shoulder lugs ensure accurate, predictable steering. A tubeless ready design means a no-hassle setup, and the Gum-X rubber compound is designed for the best grip, efficiency, and wear. Folding Bead. 30 tpi casing. Available in 2.35" x 29". Claimed weight is 1150 g.